Out of all the things you’ll purchase for your child, a car seat is one of the most important investments you’ll ever make. With all the choices and changing recommendations, it’s difficult to know which seat to choose for each stage of your child’s life. Our car seat buying guide will take some of the guesswork out of it so you’ll save time and money in finding the right car seat. From the moment your newborn leaves the hospital to the moment they’re ready for an adult seat belt, they will need a child safety restraint. Yet, there are several factors to consider when shopping for car seats. Safety ratings are important, of course, but so is your child’s age and size, your budget, your vehicle type, your lifestyle, and more. Why is it so important to find the perfect car seat? First of all, the hospital won’t let you leave if you don’t have a properly installed car seat for your newborn. Your local city and state regulations will also determine what car seat you can have and how you use it. As your child grows, their car seat needs will change as well, so you may have to purchase additional seats depending on what kind you buy. Car seat recommendations have changed a lot over the years, thanks to research from the American Academy of Pediatrics (AAP) and other agencies. Car seat rules from your childhood are probably out-of-date now. Always defer to your local regulations first, then follow the AAP recommendations. Babies should be kept rear-facing until at least 2 years old, preferably longer. Use a forward-facing harness for as long as possible after that. 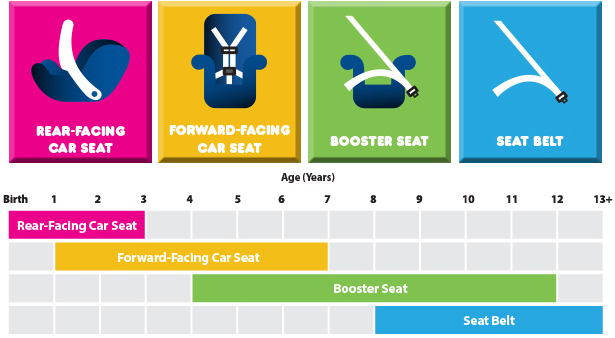 Children should be in a booster seat until they are 8 – 12 years old, 57 inches tall, and until the vehicle belt fits them as it would an adult. Replace any seat that’s damaged or involved in a crash immediately. Children should ride in the backseat until they’re 13 years old. Gently used seats that haven’t been involved in a crash can be reused, but always check the expiration date (usually 7-10 years from production date) both on the label and in the manual. Never use a recalled seat. Check the Child Seat Recall list to stay up-to-date on product recalls. Once you determine your local regulations, your child’s size, your car’s size, your budget and lifestyle, you’re ready to find a car seat that works for you. Some car seats will grow with your child for a long time. Others will need to be upgraded as your child grows. Here are the basic types of seats. 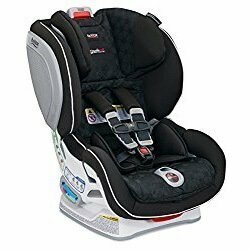 We have detailed reviews for several models of each type here on Best Car Seat Hub. All newborns must start with a rear-facing seat and should stay rear-facing ideally until age 2 or older. Infant seats are designed to only be rear-facing. Weight ranges run from around 4 – 40 pounds, depending on model. Often children will reach the max height before the max weight. If the top of your child’s head is less than one inch from the top of the car seat’s shell, it’s time for an upgrade. Infant seats are convenient because they have a separate base and can detach for use as a baby carrier. 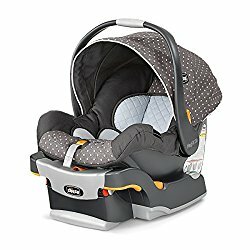 This is great for getting sleeping babies in and out of the car without disturbing them. However, since they can only be used in a rear-facing mode, your child will grow out of them quickly. These seats can be used rear-facing for infants and then converted to forward-facing as your child grows. You can either start with or switch to a convertible car seat, depending on preference. If you want to keep your child rear-facing for as long as possible, these seats have higher rear-facing weight limits (up to 50 pounds). Convertible seats have forward-facing weight limits of up to 65 pounds or more. Although they are designed to hold newborns from 4 – 5 pounds, they often are still too big for a very small baby. Many experts recommend starting with a rear-facing only infant seat for this reason. While these seats allow longer use, they can save you money. However, they cannot be used as a detachable carrier like an infant seat can. When your child surpasses the size limits of a front-facing harness seat, she’s ready for a booster seat. Booster seats lift your child so that she can use the car’s seat belt system without a harness. A booster seat ensures the vehicle belt fits as it would on an adult to keep your child safe – over the sternum, through the center of the collarbone, and then across the upper thighs. You can get either a high back seat or a backless model. Some can function as both. Backless boosters are popular because they’re cheaper, lighter and more portable. However, they don’t position the vehicle belt as well as a high back model. High back models also provide more side impact protection and provide a place for the child to rest her head. Some states have laws requiring kids up to nine years old and 80 pounds to ride in a booster seat. Always check your local laws before you decide to ditch the booster seat. Toddler boosters are slightly different than a traditional booster. 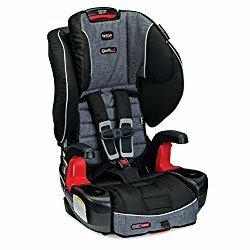 They can be used from the time your child is ready for a forward-facing seat (with a harness) until they can use a booster seat (without a harness). They fit children anywhere from 20 – 90 pounds in harness mode and 30 – 120 pounds in booster mode. These are good options if you’re upgrading from an infant car seat. These are much like convertible seats and are true money-savers that can be used from birth through booster seat age. 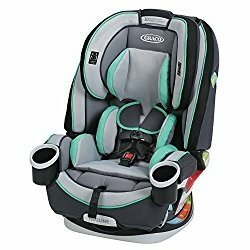 Rear-facing, they can hold babies anywhere from 4 – 50 pounds rear-facing, 20 – 65 pounds forward-facing and 30 – 120 pounds as a booster seat. While their multi-tasking functions can save time and money, sometimes they don’t perform in each mode as well as one-task seats. They can also be heavy and bulk, difficult to fit into smaller vehicles and don’t function as a carrier. However, they can be a great option for grandparents or people who won’t transport your child all that often. Know these 5 things before you buy a car seat. Know if your vehicle is compatible. Cars manufactured before September of 2002 will most likely not have a LATCH (Lower Anchors & Tethers for Children) system. LATCH was designed to make it easier to properly install a car seat without using the vehicle belts. If you have a vehicle built after 2002, you should have at least two lower LATCH anchors and one top tether. Follow your car seat and car manuals so you know how to use LATCH properly. You should also know the dimensions of your car interior. Some car seats won’t fit well in some vehicle models. To determine what seats are compatible, find the car seat dimensions and compare them to your interior dimensions. Read customer reviews to see what other parents recommend and call the manufacturer to ask if your specific vehicle model will work with their car seats. Know your budget. Car seats can cost anywhere from less than $100 to well over $500, so it’s a considerable investment for some families. Know what you can spend and look for seats within that price range. The good thing is that price does not determine the safety of a car seat. Look for options that will save you money, such as a convertible or all-in-one seat that will grow with your child from birth through booster age. Travel systems are another way to save so you won’t have to buy a separate stroller. Know your lifestyle. Not every car seat fits with every lifestyle. If you travel or commute a lot and need to frequently switch your car seat from one vehicle to the next, you want one that’s lightweight and quick to install. If walk or jog often, you’ll want a car seat that fits well on a stroller. Planning on more children? Find a car seat that has a long lifespan so you can pass it on to the next baby. Also, look for seats that will allow you to fit more than one in your backseat easily. Know your child’s size. It’s easy to keep track of your child’s age, but height and weight can change quickly over the course of a few months. Keep track of those measurements so you know when it’s time for an upgrade. All car seats have weight and height ranges. If you’re on a tight budget, try finding seats with higher size limits so you can use it as long as possible. Also, since the AAP recommends keeping your baby rear-facing as long as possible, an infant seat with a high maximum weight and height limit will allow you to do just that. Know how to install a car seat. The majority of child seats are not installed properly. So no matter how much you spend on a seat, it’s useless if you’re not using it right. A properly installed seat should not move more than 1 inch either way when you wiggle it around. Always read your car seat AND car owner manual before installing. If you’re having trouble, watch installation videos, call the manufacturer, or visit your local car seat technician. When putting your child in the seat, harness straps should be at or below baby’s shoulders in a rear-facing seat, and for a forward-facing seat, they should be at or above the shoulders. Chest clips should always be positioned at armpit level. You should not be able to pinch any fabric on the straps once your child is buckled in. If you can, that means the harness is too loose. Here is a quick guide to some of the most common car seat terms you will run across in user manuals and product descriptions. It will help you better understand safety systems, accessories, and other terms that might be confusing at first. This is a system that makes it easier to adjust a rear-facing car seat so that it can be customized for the right angle. These are replacement pieces sold for a used car seat or one that has been broken. Avoid these products at all costs. This locks the seat belt into the set position so that it keeps the seat belt tight around the passenger (or the car seat) and locks to hold you in place during a crash. A traditional booster seat, usually high back, that uses built in belt guides to position the vehicle seat on your child. This is the path through which the seat belt threads through the car seat, depending on how the seat is used. Forward facing and rear facing will often have separate belt paths. Be sure to use the correct one. They are not always clearly labeled. 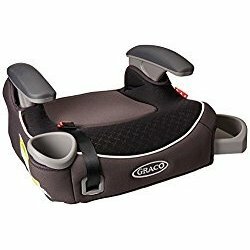 This is a restraint used for babies who are too small for a traditional infant car seat or have a medical need that requires them to lay flat. This is the plastic buckle that goes over a child’s chest and is properly positioned at armpit level. This is a separate base for a rear-facing car seat that can be installed to keep the car seat secure. This is a retractor that locks the seat belt when the vehicle slows or stops. This helps you to identify whether or not you have the incline of the seat adjusted correctly. Make sure to pay special attention to the recline angle, especially for newborns who can’t hold their heads up. Horizontal bars embedded in the crease of your back seat that help to provide more support for your car seat. These are attachments on a car seat that are used in place of a seat belt to help secure the car seat to the lower anchors embedded in your back seat. Once a child is over 65 pounds, you can usually switch to the vehicle belt for installation. Check regularly to see if your car seat is listed in any recalls. The NHTSA and manufacturers work together to repair any defects after the product has been distributed or sold. All repairs or replacements must be free, so it is well worth your time to get them. A card that comes with every car seat that should be filled out and returned so that you can get prompt notification of any recalls. A mechanism that gathers and stores extra seat belt webbing so that the system stays compact. If you get into a crash or suddenly brake, you or your child could suffer injuries from the seat belt such as bruising, internal injuries or fractures. However, these injuries are far less severe than what can happen without a seat belt. This is an air bag system that can detect the weight and/or position of a passenger in the car and disables the airbags if the passenger is below a certain weight, too close to the dash, or in a car seat. This is not available in every car. This is a tether strap and hook system that anchors the top of a forward-facing car seat to the tether anchor in the vehicle. It keeps the seat from tipping forward on impact to protect against head injuries.